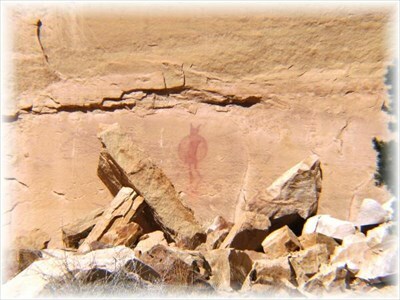 Rock Art left by the Fremont and Ute Indian cultures abounds throughout Western Colorado and Eastern Utah. 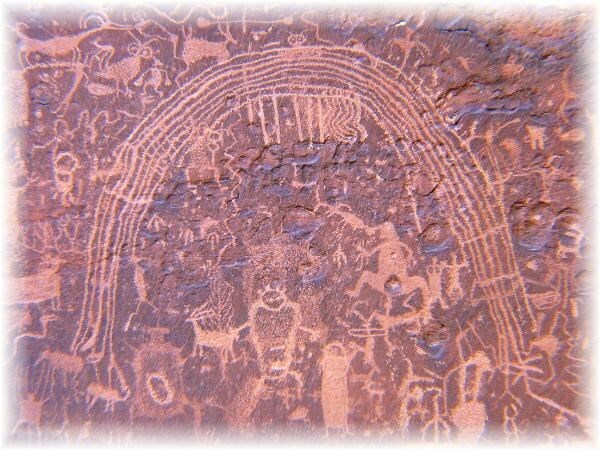 Carrot Man Rock Art is located in Southwestern Colorado in the United States near these coordinates. There are both Pictographs and Petroglyphs at this site with soaring ‘carrot men’ and other figures located on the roof of an overhang. The Fremont carved and painted interesting carrot-shaped figures and other symbols of unknown meaning as well as pictures of items and events in their lives. 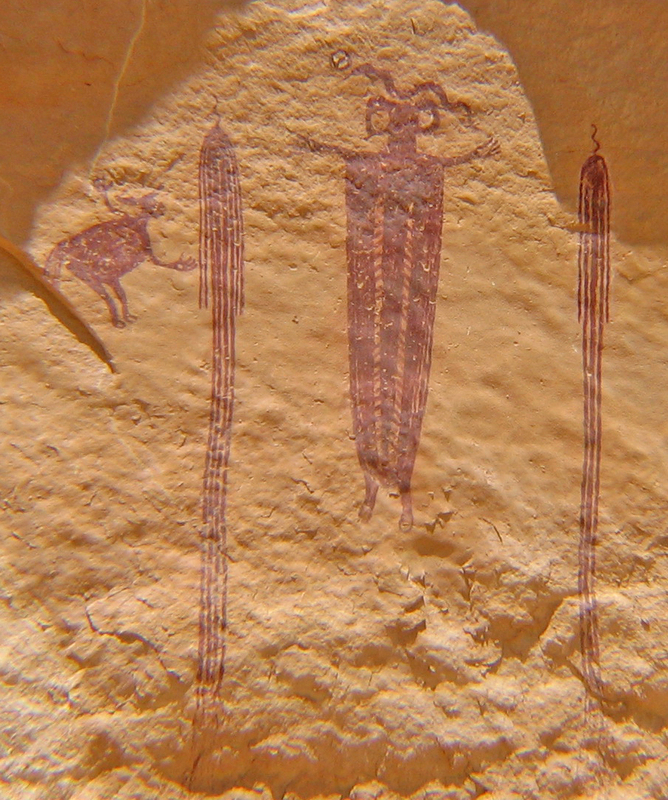 You can find Rock Art images of deer, sheep, various other animals, reptiles, birds and corn. Travel south from the town of Rangely, Colorado on a graveled road for about 11 1/2 miles and turn toward the west at the sign. There is a small parking pullout at .3 miles from the sign where you can then take a short walk down a gully to find this Rock Art. Cow Canyon Rock Art site is just one of several Native American Pictograph and Petroglyph sites located in the Canyon Pintado National Historic District. Cow Canyon Rock Art is located in Southwestern Colorado in the United States near these coordinates. These Pictographs and Petroglyphs are accessible from a turnoff into Philadelphia Draw from Colorado Highway 139 in Western Colorado. After turning East toward Philadelphia Draw you will almost immediately turn South and cross two cattle guards before turning toward the East again. There are several different objects visible at this site from both the Fremont and Ute cultures. Some of the Rock Art objects are difficult to find at first without a trained eye. Take your time and look around. You will note some vandalism of the Rock Art as well as a few more ‘modern’ additions. As always with this and other Ancient Rock Art remember that it is very Fragile and deserves our utmost respect. Take only pictures and memories! Do Not Touch as even the oils in your skin can cause the paints and rock surfaces to deteriorate. Erosion and weathering have taken a toll on many of these sites but people touching the sandstone and ‘outlining in chalk’ causes much more damage! The Rochester Creek Rock Art Site is located overlooking a scenic canyon and contains numerous images awaiting your interpretation. Rochester Creek Rock Art is located in Southern Utah near these coordinates. The Rochester Creek Rock Art is easy to access via a maintained gravel road. There is a good sized parking area and a short half-mile hike to reach the site. Towns are few and far between. There is ‘primitive’ camping available in the immediate area. 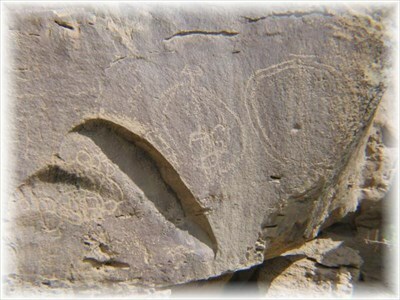 The Rochester Creek Rock Art Panel is thought to be a combination of writings from three distinct styles, the Barrier Canyon style (also known as Archaic), the Fremont style and the later Ute. The Barrier Canyon style is generally known for its painted human like figures also found in several locations in the surrounding area. Most of the images here are pecked into the rock face. The main panel here is crowded with many pictures of animals including elk, a snake, a spider, and other odd looking creatures. The main standout figure is that of the ‘Rainbow’ which is around four feet tall and thought to represent the galaxy and constellations. Please respect this and all such Rock Art. Also Please Note that the Antiquities Act of 1906 and the Archaeological Resources Protection Act provides serious penalties for vandals. Please Do Not Touch as even the oils in your skin can cause the paints and rock surfaces to deteriorate. Lone Warrior Rock Art Panel is located in the San Rafael Swell area of Southeastern Utah in the United States near these coordinates. The Lone Warrior Rock Art is well worth logging a visit while you are exploring the region of America’s Southeast. 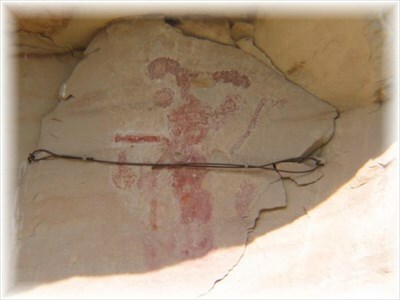 The Native American painted panel is accessible from a graveled and then a dirt road on the south side of Interstate Highway 70. The coordinates listed here are directly in front of the Pictograph. It is easily visible on the cliff face that faces southwest. This is the only figure at this location though there are others nearby. 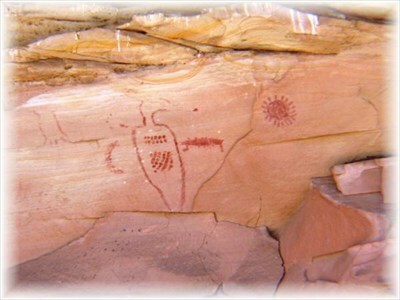 There are several Pictograph and Petroglyph Rock Art Panels located near the mouths of three canyons in the Bookcliffs of Southeastern Utah. These date from 1000 to 3000 years ago and are typical of the Fremont and Barrier Canyon style found in this area. Three Canyons Rock Art is located in Southeastern Utah in the United States near these coordinates. There are no signs indicating that this Rock Art exists. There are 2 somewhat main routes into the area, one from I-70 and the easiest off old unmaintained, Highway 6. Both roads meet at this sign. The listed coordinates are from a parking pullout along the main dirt road into the area. Please Respect the Private Property on both sides of the road at this particular point. Look toward your left(west) and up for the first panels. You will reenter BLM land a few 100 yards further. Look toward your right for a number of Pictographs(painted rock) across the wash. The road does continue for many miles where it branches from Hay Canyon to Dark Canyon. This is very rugged country and mostly used by oil and gas field workers as well as hunters. For viewing the Petroglyphs (carved stone) you should return to the junction of Hay and East Canyons and follow the road into East Canyon. Look toward your left for a close view of the Rock Art typical of this area. You will note that even in this remote location that some of the panels have been vandalized by thoughtless individuals including some photographers who think that outlining the art in chalk is a ‘good thing’. Just Don’t! You will also notice a few more ‘modern’ additions. If you are in the area you might want to visit some other nearby sites that will post here. And Please Remember that the Antiquities Act of 1906 and the Archaeological Resources Protection Act provides serious penalties for vandals. Please Do not touch as even the oils in your skin can cause the paints and rock surfaces to deteriorate. 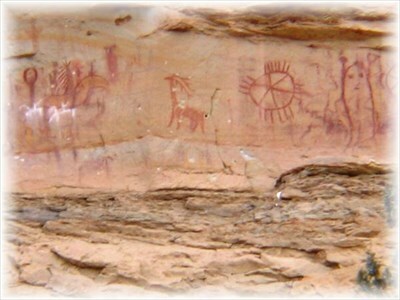 Located in Western Colorado there are at least four separate panels of Pictographs along the McDonald Creek wash. The area has been renamed the ‘McDonald Creek Cultural Resource Area’ and is part of the recently renamed ‘McInnis Canyons National Conservation Area’. (So much for politicians!) Most folks still just call it ‘Rabbit Valley’. There is No Camping in the ‘Resource Area’ although there is camping available close by. Also I would recommend a high clearance vehicle. McDonald Creek Rock Art is 1000 years old and thought to be from the Fremont Indians. Thanks to the Bureau of Land Management for helping to protect this fragile, prehistoric archaeological site. A few miles south of I-70 you will find the start of a trail and signs pointing you to the locations of the rock art. There is a parking area here and a restroom. Please walk in the stream bed as much as possible as this practice helps prevent development of additional trails. There is more information for this site available at the BLM web site. McDonald Creek Rock Art is located in Southwestern Colorado in the United States near these coordinates. The coordinates listed here will put you directly in front of the first panel. As mentioned previously here, there has always been a division on whether the specific locations of Rock Art Sites should be shared with the General Public. There are those that believe that as individuals living in this country we should have the right to any and all information that Our Government and it’s workers (our friends and neighbors) have gathered for whatever purposes. It is important to share locational information in order to broaden the research base and educate the said General Public on the roots of societies as well as develope a common respect and reverance for Rock Art and Rock Art Sites. By being able to directly travel to a previously documented Site prevents needless crissrossing of sensitive environment where many Rock Art Sites exist. And then there are those that prefer to keep all things secret when it comes to Rock Art site location. Let folks find it on their own, it’s better experience that way. If people find out about Rock Art, well, it’ll be ruined! Vandalized by people trying to take it home with them. And the more folks that know where a Rock Art Site is then the more distruction of the surrounding area with footprints and trails and noise and litter. Either way, what do you think? Take a moment and share your position! There are two Ancient Rock Art panels located here. 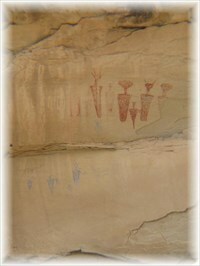 One of the panels is sometimes referred as the ‘Best Preserved’ Pictographs of the Barrier Canyon style. The “Head of Sinbad” Rock Art is located in Southeastern Utah in the United States near these coordinates. The Head of Sinbad Rock Art is fairly easy to access via dirt and graveled roads off I-70. I would highly recommend a four wheel drive vehicle if you wish to drive right up to the site, otherwise you can drive within about 3/4 mile. Although you can see the interstate from the Rock Art site you can not see the art from the highway! Take the time and explore this region of the San Rafael Swell in southern Utah with several other Rock Art sites nearby and also many Arches and other Historical and Natural wonders. The coordinates listed are directly in front of the cliff along a log fence that prevents vehicles from getting any closer. The Head of Sinbad Rock Art site is actually named for the surrounding rock formations rather than the figures themselves. There are two panels of the Barrier Canyon style on a south facing cliff. These two Pictographs were painted thousands of years ago and the one on the right is still one of the most preserved of this type. The panel on the left is slightly covered from mud flowing from the cliffs above. Pictographs and Petroglyphs, Anthromorphs and Zoomorphs. Pecked, Painted, Scribed, or Brushed, this particular surface here on WordPress is designated to Rock Art. Ancient Rock Art. Especially that of our Ancestral Native Americans. Here I will provide a plethora of information and personal insight from decades of research and up close encounters from throughout the Greater American Southwest landscape. This is where one can experience the vast canvas of Mesas, Mountains, Deserts, and Canyons and hopefully develop a shared appreciation for Ancient Graffiti. To divulge the closely held ‘secret’ locations of our Ancient Native American panels of Rock Art has always a been a sort of dividing line amongst those that seek out such knowledge for whatever personal reason. Whether it be a devout Archaeologist or just a novice Photographer I seriously doubt that even any degree between ether side of the spectrum lies in wait that dreaded Vandal. I also understand mankind’s inherent greed and also occasional altered mental states brought about by various indulgences as demonstrated by those brought to justice for deeds against our Rock Art. Contrary though, the more knowledge that is shared, the more educated the masses become, and societal outlook on Artifacts and Archaeological Evidence molds to more natural moral respect. Additionally more observers equals a more varied interpretational base.